You know you need to exercise. I know that I do. You know that you need to run lots of errands each week. Riding your bicycle or walking to that place will take you more time. But you have to go there anyway! Why drive to the gym and run on a treadmill when in the same time it would take you to do both, you could save fuel, help the environment and enjoy being outside? Disclaimer: I realize this only works if you live in a town big enough that you can do your errands close to home. This is a slightly bizarre thought I’ve had: why don’t they hook up all the exercise bikes, treadmills, stairmasters – whatever – to generating the power at the gym when they’re in use? Another factor to consider is that some cities (like mine, San Antonio) are very bicycle-UNfriendly. I.e., you take your life in your hands if you try riding a bike on many of the streets here. It is also too darn HOT here most of the year to want to do very much outside, at least for me. Johanna – I’ve thought that before, too. Bill – You are right – it takes a lot of gumption to do productive exercise in places as hot as San Antonio. After I wrote that, I went out on my Friday errands and picked up a copy of The Current (S.A. free paper). This week’s cover story is called “Bike Wars” and is about difficulties cyclists have in this city. The situation’s also been documented in the main paper here in SA this year. Supposedly Austin is much better, as you might expect. I’ve heard of D. Byrne’s book but have not read it. Sorry about San Antonio’s lack of enlightenment! Mostly out of respect and paranoia of my car, I like to park in the furthest spot away from the store and walk. It takes a little longer, but I get a little exercise and avoid dings on my doors! PS. 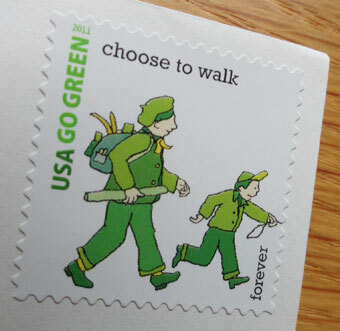 Is that a real US Forever Stamp? That’s a good way to get more exercise, James!